You’re never going to have a problem finding things to do in Punta Cana. Aside from the miles of truly stunning beaches, there are plenty of cafes, restaurants and bars where you can sit and watch the sun go down. For more action take to the water on a catamaran, enjoy the warmth as you swim or feel the breeze in your face as you zoom down a zip-line. If you want more inspiration for what to do in Punta Cana, here are our top 10 recommendations. If you love chocolate then you’ll love ChocoMuseo Punta Cana. It’s a must see Punta Cana attraction if you have a sweet tooth. It’s free to look around and learn more about the food that enchants millions the world over. 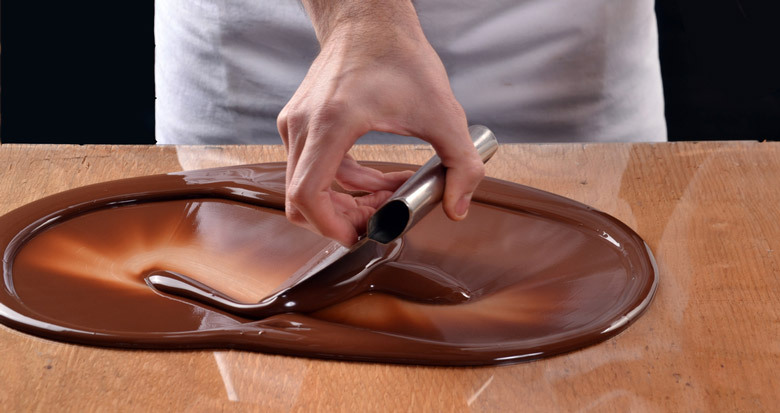 You know you love the taste of chocolate but what do you know about how it’s made? Now you can find out lots of fascinating facts. The tour of ChocoMuseo Punta Cana includes a look at the “bean to bar” factory. You can even choose to try your hand at making chocolate yourself, at one of the chocolate making workshops. This is something that every chocoholic dreams about! Once you’ve finished exploring the site you can relax and have some refreshment; there are delicious chocolate drinks and cakes on offer. It’s not just about chocolate though. You can also buy some local handicrafts at the onsite store. If you’re looking for things to do in Punta Cana then ChocoMuseo Punta Cana should certainly appeal to your taste buds. If you enjoy a round of golf then you’ll definitely be impressed by Punta Espada Golf Course. It’s a Jack Nicklaus Signature course and is renowned as one of the best courses in the world. The best thing about playing a round at this golf course is that you don’t just get to enjoy the game; you get to admire the incredible views too. The greens and fairways are immaculate and stand out against the contrasting blue background of the sea. The course isn’t just about enjoying the view though; it provides a challenging game of golf. 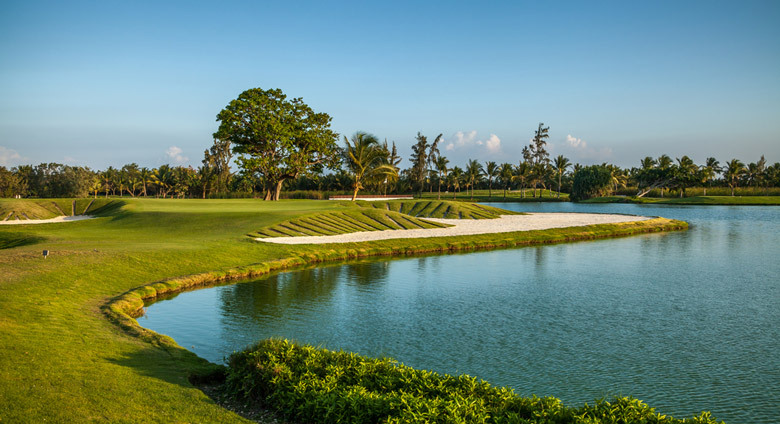 In 2010 it played host to the Cap Cana Championship which is an official event on the PGA Tour. If the professionals find the course to be a good test of their skills then you can be sure it presents a good challenge for you too. A visit to Punta Espada Golf Course makes an interesting change to simply enjoying the beaches, and being such a renowned course makes this a definite addition to a golf-lovers list of top things to do in Punta Cana. 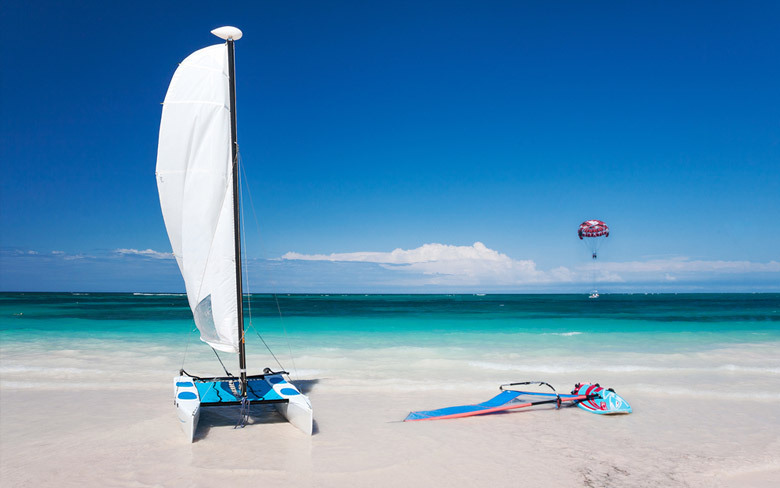 Bavaro is an area with many small and beautiful beaches as well as an array of amenities for visitors to enjoy. 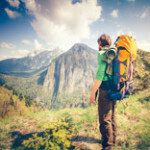 In 2011 a group of people involved in the local tourism industry decided that there was a need for an adventure park to add something extra to the already impressive amenities. The idea was to offer a Punta Cana attraction that was a little different. The park was planned to be exciting and challenging as well as friendly to the environment. Today, all of those dreams have been realized and visitors to the Punta Cana area can get their adrenaline rush on a visit to Bavaro Adventure Park. There are plenty of attractions for all the family at the park. If you have ever fancied having a go at trampolining then you’ll get the chance, on the Jumping Trampoline. You get to soar high in the air in a controlled and safe environment. If you want to continue with the adrenaline rush you can take some zip-line training then choose one of the exciting zip-line based courses to explore. A visit to Bavaro Adventure Park makes a great contrast to a day spent lazing on one of the nearby beaches. 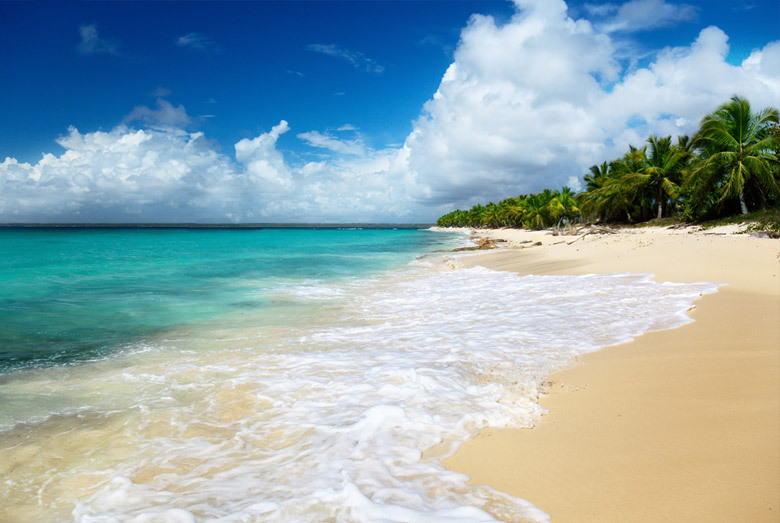 Among Punta Cana’s attractions, the beaches are most popular though they’re always busy. Juanillo Beach is one of the quieter beaches in the Punto Cana area and there are usually plenty of beach chairs available here if you prefer a quieter atmosphere. The beach is home to several coconut palms which help to make this an idyllic location and the water is so tempting and kept completely clear of seaweed. After a swim you can freshen up in the showers which are clean and inviting. There is also a beachside café where you can seek some refreshment after a day spent swimming, or relaxing in the sun. If you want to take a trip on the water there are some small sail boats that you can rent for a trip as well as several kayaks. All of the activities on Juanillo Beach are set to a soundtrack of appropriate beach influenced music. If you’re lucky you might even be able to catch one of the evening concerts that occasionally take place on the beach. After a day at the beach you can take a stroll to the nearby Sanctuary Cap Cana resort which has several restaurants that are open to the public, where you can end your day with a relaxing meal. A trip to Isla Catalina should definitely be on your list of what to do in Punta Cana. Isla Catalina is a tropical island that’s situated around 2.4 kilometers (1.5 miles) off the coast. In the 15th century it was a haven for pirates and although the shores have not changed a great deal since then the visitors have! Today most of the people enjoying the beaches of Isla Catalina are tourists who arrive either on one of the visiting cruise ships of one of the local boat tours. The island is a beautiful place to visit. 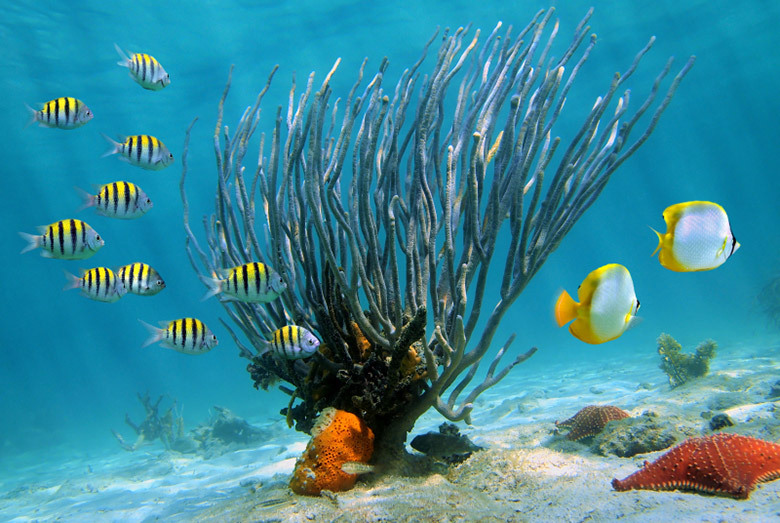 It’s surrounded by fine coral reef which is home to an array of colorful fish and the waters are the perfect place to try your hand at snorkeling. If you’re an experienced diver you will probably want to visit The Wall which is a steep drop off. The island is not as remote or tranquil today as it was during the time of the pirates. There is a bar and restaurant that are both very popular with visitors but they add to the appeal of the island rather than detract from it. Isla Catalina may not be as quiet as it once was but it’s still a little piece of paradise. There has been a lot of development around the Dominican Republic; much of it to keep up with demands of the tourist industry. This doesn’t mean there aren’t still areas of great natural beauty which have remained untouched. The Indigenous Eyes Ecological Park is vast and is home to an array of flora and fauna. The fauna on view includes more than one hundred different species of bird, twenty seven of which can only be found in the Dominican Republic. They are joined by more than one hundred and sixty species of insect and flora that includes more than five hundred different types of plant. If you want to get the most from a visit to the park then you can take advantage of one of the three hour long guided tours that are available, in four languages, English, German, French and Spanish. You can see the eye catching natural lagoon or get close to the wildlife at the iguana farm and there’s also a petting zoo which is especially popular with younger visitors. Indigenous Eyes Ecological Park provides a fascinating insight into the nature of the Dominican Republic. One of the most appealing features of the Dominican Republic is its natural beauty which has yet to be spoiled by the amount of resort development that has happened in recent years. The beaches of the country are renowned for their beauty and they are set against a backdrop of mountains, forests and lush fields. As Punta Cana’s natural attractions go, there is one sight you really shouldn’t miss. Hoyo Azul is a natural lagoon that is situated at the foot of a cliff. It’s also known as the Blue Hole and its crystal blue waters are really impressive to see. If you want to see the lagoon you should book on a tour; they do pick-ups from hotels in Punta Cana so it’s simple to join one. 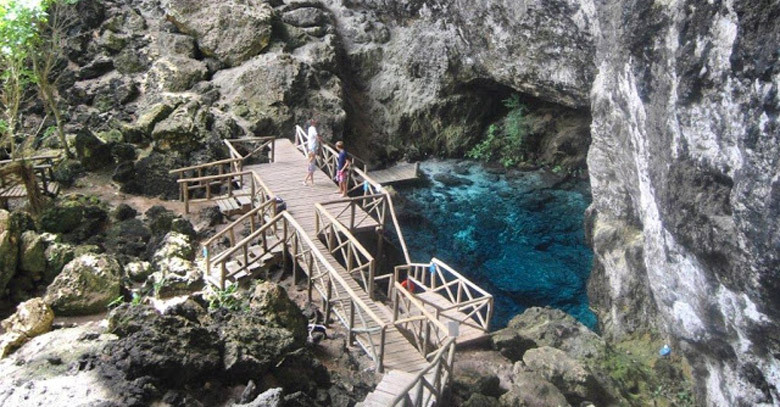 You can explore the lagoon via a trip hiking through the caves or zoom in on a zip-line. 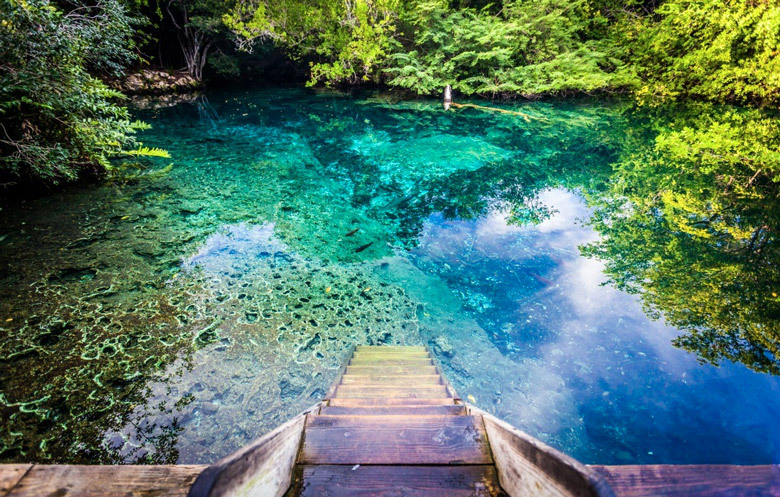 Either way, a trip to Hoyo Azul is one that will take your breath away and that you’re never likely to forget. It’s not surprising that this isn’t the first beach that is featured in our list of the top 10 things to do in Punta Cana. Fantastic beaches are what this area is best known for and Macao Beach meets up to expectations. 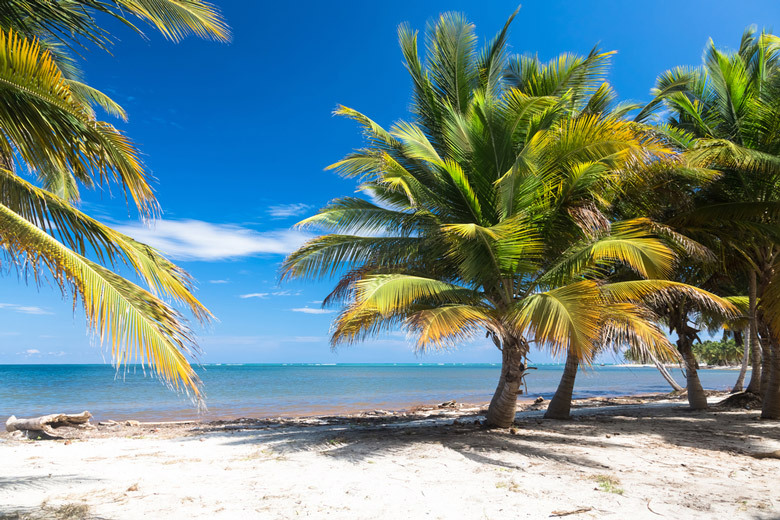 It has even been mentioned by UNESCO as being one of the best beaches in the Caribbean and it is especially renowned for having fine sand and picture postcard palm trees that help to give the whole area a sense of exotic beauty. This is what Caribbean beaches are all about! If want to learn to surf then you may want to check out the opening times for the surf school which provides both lessons and surfboard rental. If you would rather take to the water swimming then you should head to the middle of the beach. After swimming or surfing you can head to the southern part of the beach where you can enjoy a meal at a cliff top restaurant and look out over the beach as the sun sets. What a way to end your day. If you’re looking for things to do in Punta Cana, then take yourself off to Isla Saona; it really is a tropical paradise. The island lies at the south east tip of the Dominican Republic, just off the coast. It’s a relatively unspoiled place to visit; possibly due to the fact that there are no hotels on the island. The tourists who visit do so only on day trips though getting here is half the fun… Many of the excursions to the island include not just the boat trip but also entertainment such as drinking and dancing on the boat. It’s a good opportunity to combine viewing the region’s natural beauty with having some party time. One of the great things about Isla Saona is that it’s really easy to get there. You can arrange to be picked up at your hotel in Punta Cana as part of the trip. Then all you have to do is sit back and enjoy the day. 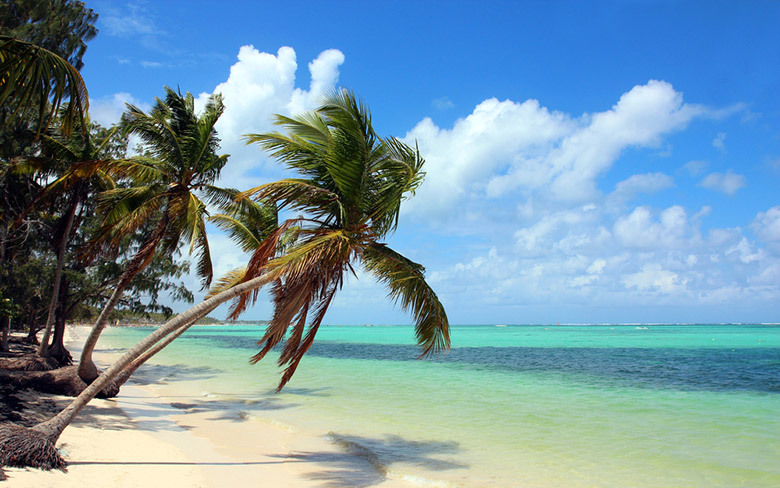 We mentioned the Bavaro area earlier in our list of what to do in Punta Cana. Bavaro Beach is at the center of this popular tourist destination where you can spend time relaxing on the sand or take a trip to the village of El Cortecito where you can buy souvenirs of your vacation. 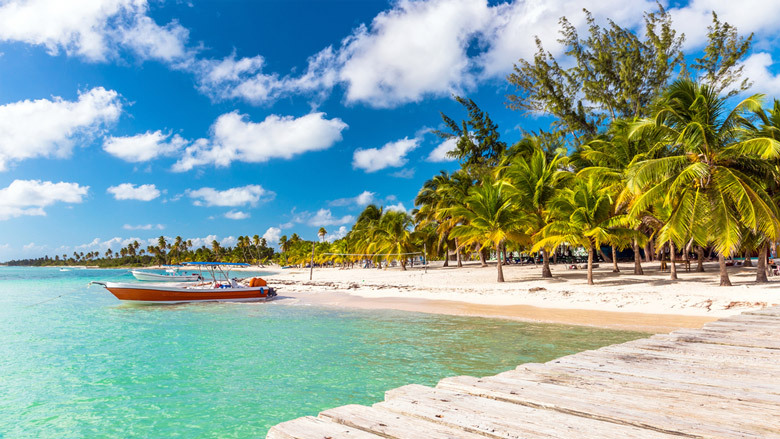 Staying around Bavaro Beach itself you can take advantage of the warm waters with a relaxing swim, or opt for some of the more active water sports which are abundant here. Go snorkeling or scuba diving or check out the underwater scenes in a more relaxed manner on a glass bottom boat. There is also plenty of the normal beach related activity you might expect such as banana boating and windsurfing. Away from the beach you can try four wheel biking or take a trip in a helicopter. 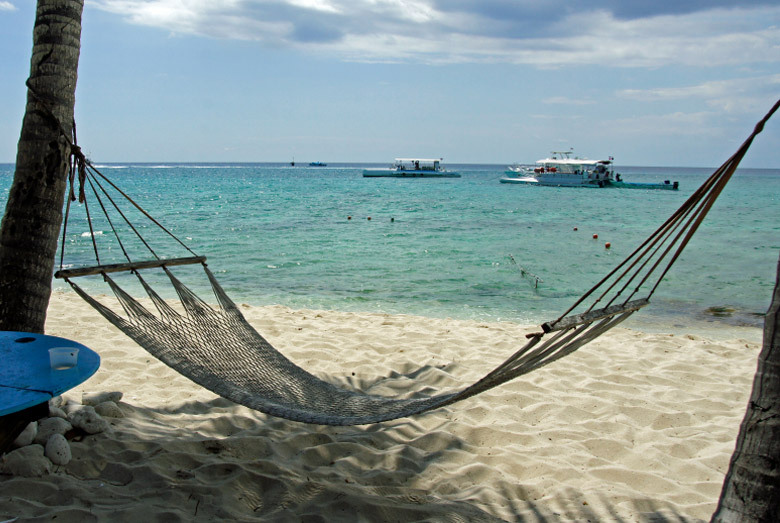 There is no shortage of activities to be enjoyed if you spend time at Bavaro Beach, or you might just want to relax on the fine sand beaches then make your way to one of the many bars of cafes in the area for some welcome refreshment. 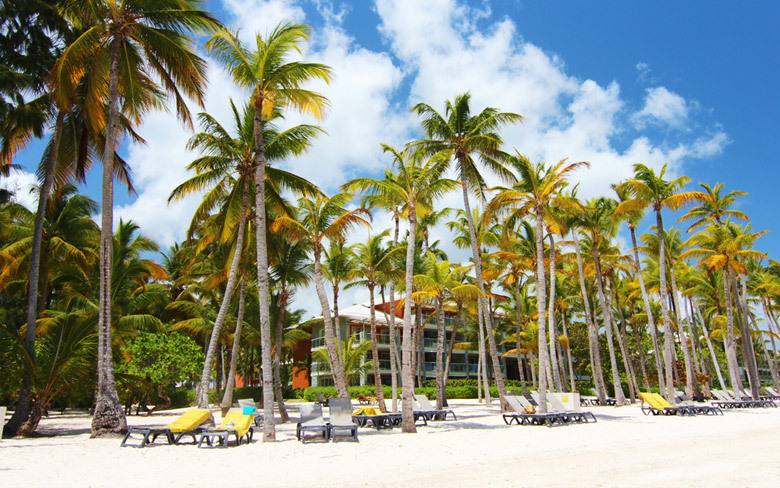 With such a selection of attraction all in one place, Bavaro Beach is our number one Punta Cana attraction.